Definition at line 45 of file mesh.c. Definition at line 61 of file mesh.c. Referenced by count_attributes(), d3dx9_mesh_CloneMesh(), d3dx9_mesh_LockAttributeBuffer(), d3dx9_mesh_OptimizeInplace(), d3dx9_mesh_Release(), D3DXCreateMesh(), fill_attribute_table(), and remap_faces_for_attrsort(). Definition at line 62 of file mesh.c. Referenced by d3dx9_mesh_LockAttributeBuffer(), and d3dx9_mesh_UnlockAttributeBuffer(). Definition at line 64 of file mesh.c. Referenced by d3dx9_mesh_CloneMesh(), d3dx9_mesh_GetAttributeTable(), d3dx9_mesh_LockAttributeBuffer(), d3dx9_mesh_OptimizeInplace(), d3dx9_mesh_Release(), d3dx9_mesh_SetAttributeTable(), and fill_attribute_table(). Definition at line 63 of file mesh.c. Referenced by count_attributes(), d3dx9_mesh_CloneMesh(), d3dx9_mesh_GetAttributeTable(), d3dx9_mesh_LockAttributeBuffer(), d3dx9_mesh_OptimizeInplace(), d3dx9_mesh_SetAttributeTable(), and fill_attribute_table(). Definition at line 55 of file mesh.c. Definition at line 54 of file mesh.c. Referenced by d3dx9_mesh_GetDevice(), d3dx9_mesh_Optimize(), d3dx9_mesh_Release(), and D3DXCreateMesh(). Definition at line 53 of file mesh.c. Referenced by d3dx9_mesh_CloneMeshFVF(), d3dx9_mesh_GetFVF(), D3DXCreateMesh(), and D3DXCreateMeshFVF(). Definition at line 47 of file mesh.c. Definition at line 60 of file mesh.c. 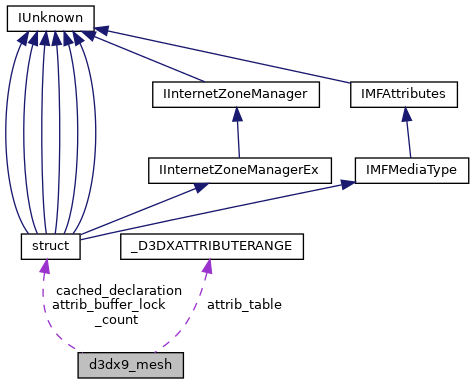 Referenced by d3dx9_mesh_GetIndexBuffer(), d3dx9_mesh_LockIndexBuffer(), d3dx9_mesh_Release(), d3dx9_mesh_UnlockIndexBuffer(), D3DXConvertMeshSubsetToSingleStrip(), and D3DXCreateMesh(). Definition at line 58 of file mesh.c. Referenced by copy_declaration(), d3dx9_mesh_GetDeclaration(), and D3DXCreateMesh(). Definition at line 50 of file mesh.c. Referenced by count_attributes(), d3dx9_mesh_DrawSubset(), d3dx9_mesh_GetNumFaces(), D3DXCreateMesh(), D3DXCreateMeshFVF(), and fill_attribute_table(). Definition at line 51 of file mesh.c. Referenced by d3dx9_mesh_GetNumVertices(), D3DXCreateMesh(), and D3DXCreateMeshFVF(). Definition at line 52 of file mesh.c. Referenced by d3dx9_mesh_GetOptions(), and d3dx9_mesh_Optimize(). Definition at line 48 of file mesh.c. Referenced by d3dx9_mesh_AddRef(), and d3dx9_mesh_Release(). Definition at line 59 of file mesh.c. Referenced by d3dx9_mesh_CloneMesh(), d3dx9_mesh_GetVertexBuffer(), d3dx9_mesh_LockVertexBuffer(), d3dx9_mesh_OptimizeInplace(), d3dx9_mesh_Release(), d3dx9_mesh_UnlockVertexBuffer(), and D3DXCreateMesh(). Definition at line 56 of file mesh.c. Referenced by d3dx9_mesh_Release(), and D3DXCreateMesh(). Definition at line 57 of file mesh.c. Referenced by d3dx9_mesh_GetNumBytesPerVertex(), d3dx9_mesh_UpdateSemantics(), and D3DXCreateMesh().